One of the authors of this work, Staffan Elgelid, edited a previous book with a similar title that I reviewed for this site, Yoga Therapy: Theory and Practice. That short volume provided a solid foundation in the research demonstrating the effectiveness of yoga therapy, but it offered little in the way of practical applications. Yoga Therapy: A Personalized Approach for Your Active Lifestyle makes for a perfect follow-up that that earlier release. This stand-alone work targets yoga practitioners as its main audience, but yoga instructors will find a wealth of wisdom to enhance their teaching as well. 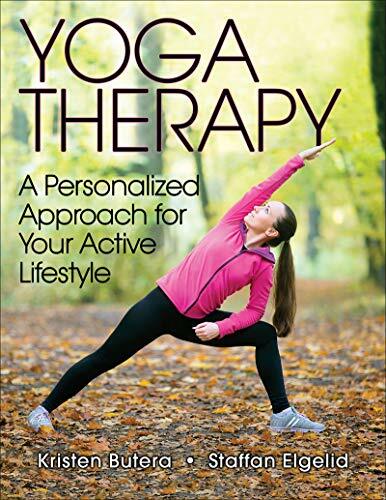 In describing yoga therapy, co-authors Kristen Butera and Staffan Elgelid focus on the individualized nature of the practice, explaining how one's unique characteristics can serve to create a tailored practice with personalized outcomes. They make distinctions between the practice of yoga therapy versus more "traditional" yoga, mainly as practiced in group classes. The emphasis of yoga therapy is on subjective, individual inquiry with an avoidance of absolutes. To teach customized attention to one's body, the authors first provide a general overview of the body's movement systems. While introducing basic information on the skeletal-muscular system, Butera and Elgelid also introduce the first "Exploration," a series of exercises for self-examination which appear throughout the book. These simple inquires encourage the reader to examine the body in various positions, noticing how minor shifts and changes may make a potential impact. This basic process of what the authors call "Identification, Differentiation, and Integration" serves as the core of the book. Butera and Elgelid define identifying as being aware of what one is already doing, differentiation as recognizing options for changing movement patters, and integration as incorporating this new learning. The sections two and three incorporate these three key concepts into the practice of yoga therapy. "Part II, The Foundations of Practice," goes into further detail regarding individual differences and reviews methods for creating a personal practice, such as using props, developing breath awareness, cultivating relaxation, and preventing injury through increased awareness. The final section of the book, "Poses for Lifelong Fitness," more specifically addresses the use of yoga asana (poses) in the differentiation process. For each posture, the authors offer Basic Options, ways to adjust the standard pose to one's body type; Mobility, targeted means to nurture range of motion within the joints; Strength, a variety of focused methods for activating muscular activity; Balance, fostering the ability to remain upright in both stillness and movement; and finally, Recovery, more passive/resting variations for practice. The postural movements cover all major areas of the body. A series of joint mobility exercises targets neck, shoulders, pelvis, spine, lower body (foot, leg, and hip), and full-body. Emphasis is also placed on the directions of spinal movement (forward bend, backbend, side bend, and twist) as well as poses promoting attention to the core, balance, hips. The last chapter, "Maintaining Fitness and Activity Levels," provides useful suggestions for deepening one's practice of yoga therapy, including applying the knowledge gained to movements off the mat. Yoga Therapy: A Personalized Approach for Your Active Lifestyle is appropriate for all levels of yoga practitioners—even if brand new to the practice—but it will have the most benefit for students who are dedicated to the practice of self-study (or svadhyaya in Sanskrit). This book provides a thorough, well-written guide for creating a completely customized and personally beneficial yoga lifestyle.